The family of Kate Steinle announced on Tuesday that it filed three claims against local and federal agencies that it says were responsible in the San Francisco woman’s death. Kate Steinle was allegedly shot by Juan Francisco Lopez-Sanchez, a immigrant in the U.S. illegally who was eligible for deportation. The claims pave the way to civil lawsuits which could win monetary compensation for family members. However, Brad Steinle, Kate Steinle’s brother said the lawsuit has little to do with money and everything to do with forcing law enforcement officials to change the way that they operate. “The system failed our sister [....] No amount of money will ever bring Kate back, but I hope that us standing here today making a statement will start the process of change,” Brad Steinle said at a press conference on Tuesday. News of shooting polarized the political debate over immigration reform and immigration enforcement. In Congress, existing proposals to crack down on so-called sanctuary cities have been expanded and rebranded under the name “Kate’s law.” Pro-immigrant groups have argued that one case shouldn’t dictate entire national policies. Individual law enforcement agencies have offered their condolences but haven’t changed any policies or admitted wrongdoing. The family’s lawsuits aim force changes in San Francisco and at the federal level. Three government agencies were cited in three separate claims, all related, the family claims with Kate Steinle’s murder. Here’s how the family says that each agency was at fault in Steinle’s death. 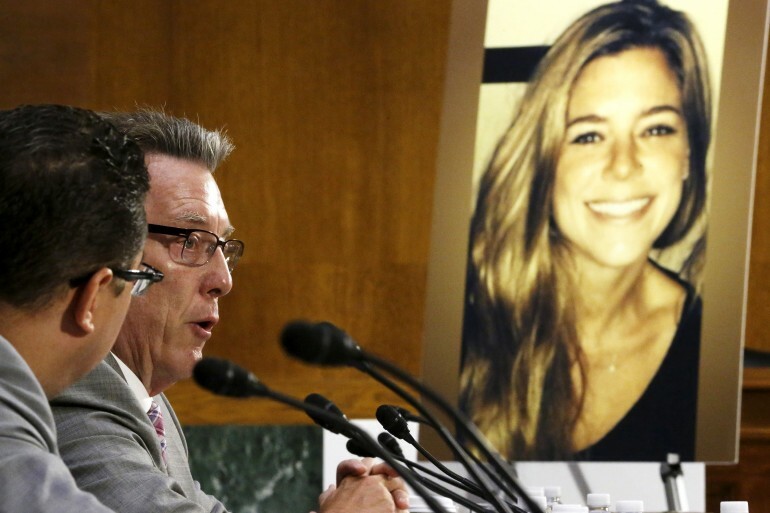 The family believes that if SF Sheriff Mirkarimi had honored an ICE detainer request, Kate Steinle would still be alive today, as her alleged killer would have been deported. Mirkarimi has stated in the past that ICE should have obtained a warrant, and that they are at fault. That’s inspired a backlash from federal officials, and their comments are reportedly cited in the complaint. “Law enforcement should have notified the immigration authorities,” Sen. Dianne Feinstein (D-California), has said in the past , indirectly blaming Mirkarimi. One of the family’s claims asserts that the Department of Homeland Security, which oversees ICE, had a “duty to detain and deport Lopez-Sanchez, yet failed to do so,” according to the L.A. Times . It alleges that ICE knew that it needed a warrant to arrest Lopez-Sanchez, but dropped the ball on getting the paperwork together so that it could detain him and put him into deportation proceedings. Like the complaint against Mirkarimi, the claim is aimed at the apparent blame-game between federal and local officials. The BLM doesn’t have much to do with immigration, but the 9mm Glock handgun used in Steinle’s homicide was reportedly stolen from an agency vehicle four days before the shooting. The claim alleges that the gun was stored in a BLM agent’s car against department policy . Specifically, the complaint says that the fully-loaded weapon was kept in the vehicle "unattended in a backpack that was in plain sight." Lopez-Sanchez is currently in jail on awaiting trial on charges of murdering Kate Steinle. He has admitted on camera to being in possession of the BLM pistol. However, his attorney Jeff Adachi says that Lopez-Sanchez did not steal the gun from the BLM agent’s truck. Adachi says that he found it under a park bench wrapped in a T-shirt, and that the gun went off accidentally.